GHL, the company responsible for such great products as the ProfiLux controller and the various Mitras LED fixtures, is filling out their accessory line with some fancy new probe holders. 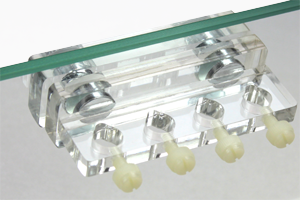 The probe holders come in two versions, with the smallest holding a single probe and the largest accommodating up to four. 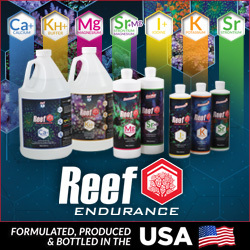 Both models sport clear acrylic wrapped around embedded neodymium magnets, which allow the units to be placed anywhere in the aquarium or sump. Securing the probes within the holders are nylon thumbscrews, which simply tighten down on the probes. For the sake of visual continuity, we would have preferred to see titanium thumbscrews, but given the fragile nature of glass probes, we can certainly appreciate GHL going with function over style. The magnets are clearly visible from within the probe holder, a design not unlike the Vertex probe holders. 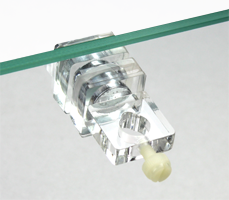 Each probe holder can work on glass or acrylic that is up to 15mm thick.